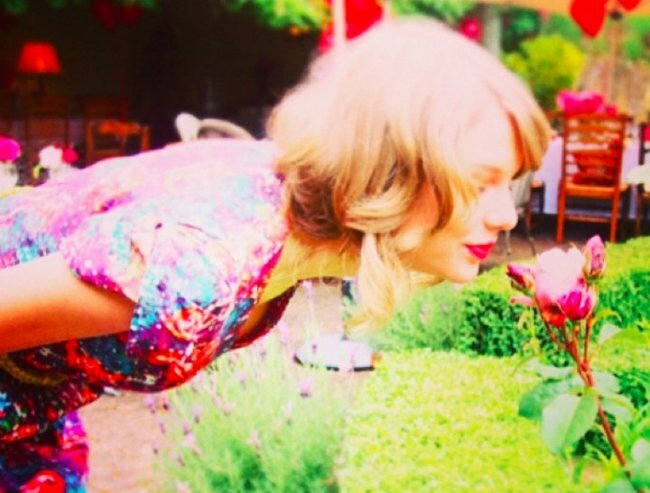 The darker side of Taylor Swift and her Girl Squad. Last December, I was working on the weekend and my colleagues kept messaging me a picture and telling me that we needed to write about it. “IT’S THE INSTAGRAM PIC YOU WISH YOU WERE IN!”. In truth it was small and blurry and someone was wearing a mask that maybe was a poo? My colleagues were right, of course. It was the biggest Instagram picture of the year. 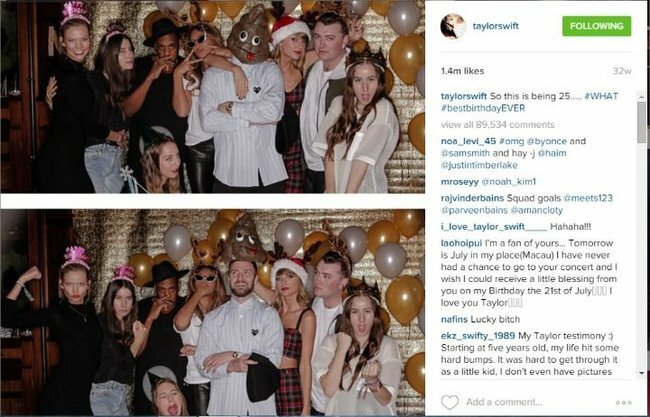 It was Taylor Swift’s 25th birthday and there were lots of celebrities there having a great time (Jay-Z, Beyonce, Sam Smith, Karlie Kloss, Emma Roberts, models, actors, performers. Justin Timberlake was under the poo mask). I know who Taylor Swift is. I know how to Shake it Off. I like that she is tall. But that was my first real sense of Taylor Swift’s party posse. Her penchant for being photographed surrounded by other celebrities. And this was different than when Paris Hilton or Kim Kardashian did it because Taylor Swift’s celebrity friends seemed to be pretty happy to be there. They seemed to be having a good time. They seemed to like this 25 year old woman. Good for them. 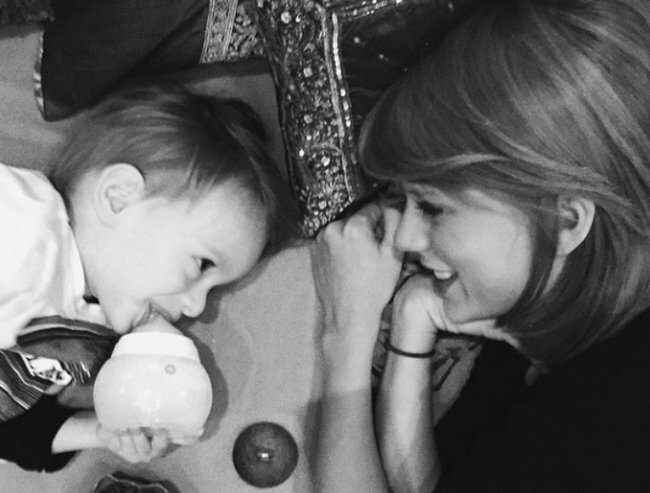 Flash forward half a year and the images of Swift with her mates have become THE Taylor Swift story. 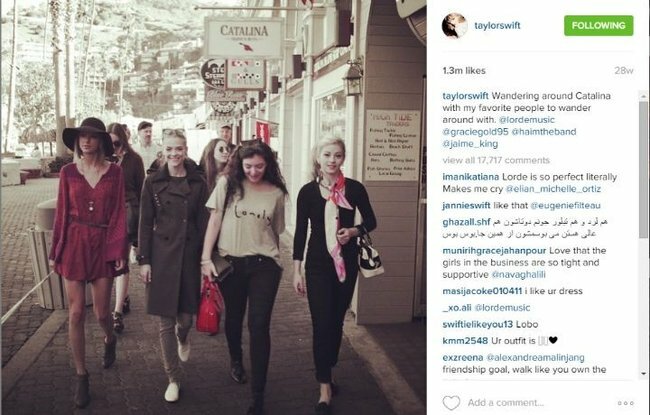 While the use of the word “squad” to describe a group of friends has been around for decades, the phrase “#SquadGoals” is now synonymous with Swift and her celebrity pals. 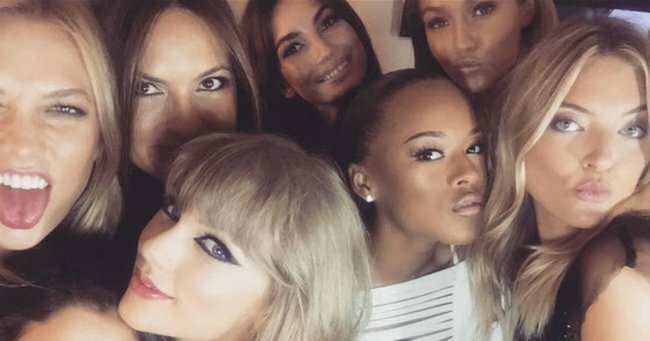 Taylor Swift has a Girl Squad, filled with the best looking, coolest women around. A flick through her Instagram will show you how she rolls: She and her cool girl group are just hanging out being fun and carefree. At the MTV VMAs this year, she and her group sat at a table adorned with a sign that said “reserved”. 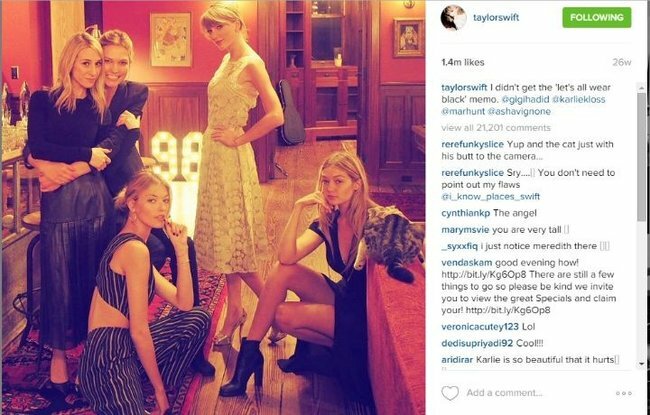 The expressions on the faces of Taylor Swift and her friends scream exclusivity. Taylor Swift’s squad at the MTV VMAs. Image via Getty. Her live shows around the world have been no different. There is a catwalk from the stage to the audience on which Taylor invites her pals to walk. Everyone from Heidi Klum to the American Women’s Soccer team to her cats (named after celebrities who now appear in her film clips) stride out to dance a little and be hugged. Faces of other women from Swift’s Girl Squad flash up on the screen and say nice things about her: Selena Gomez, Karlie Kloss, Lena Dunham, the sisters of the band Haim. Taylor Swift music video.Selena Gomez as Arsyn. 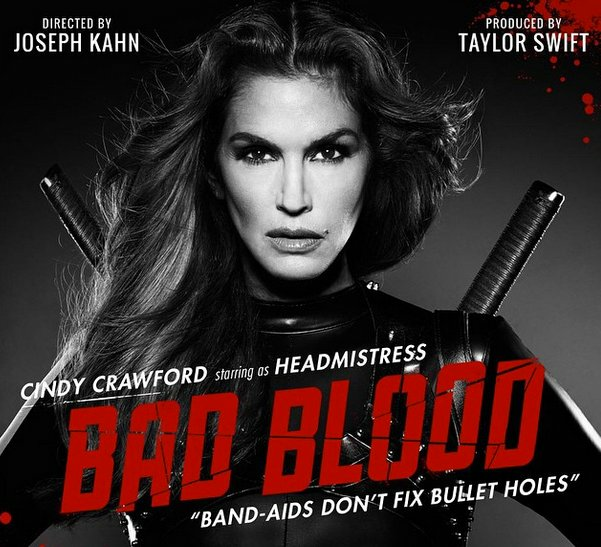 Taylor Swift music video.Cindy Crawford as Headmistress. Taylor Swift music video.Cara Delevingne as Mother Chucker. 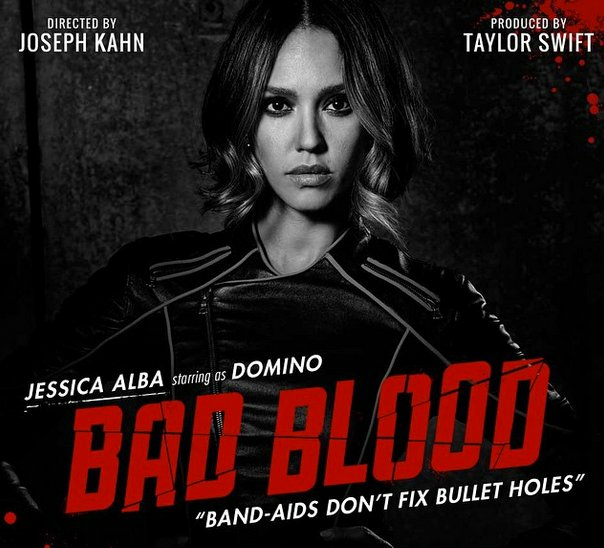 Taylor Swift music video.Jessica Alba as Domino. 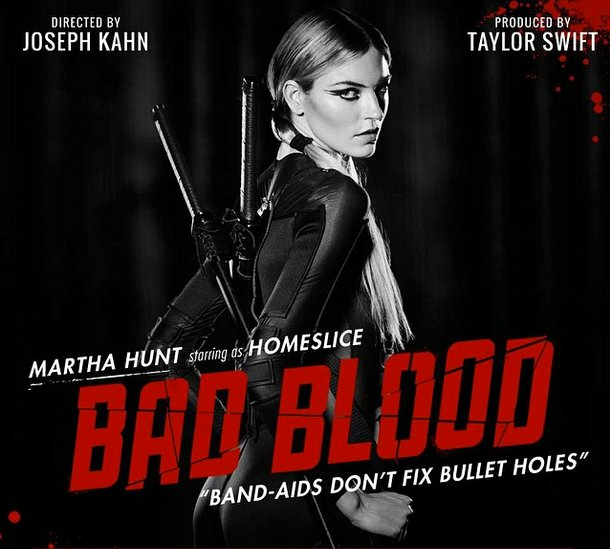 Taylor Swift music video.Martha Hunt as HomeSlice. 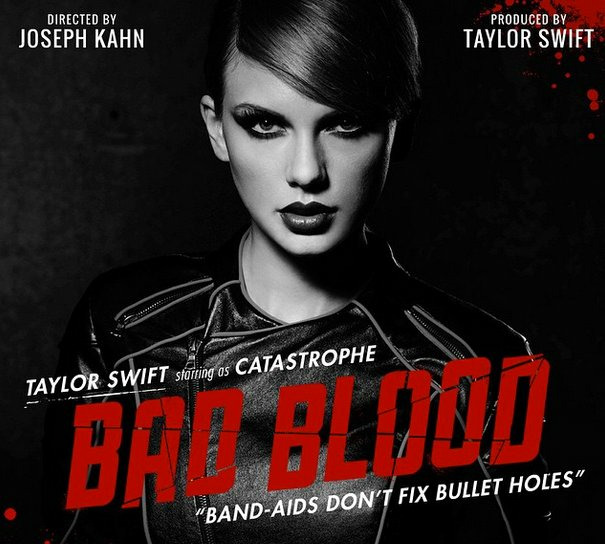 Taylor Swift music video.Taylor Swift as Catastrophe. 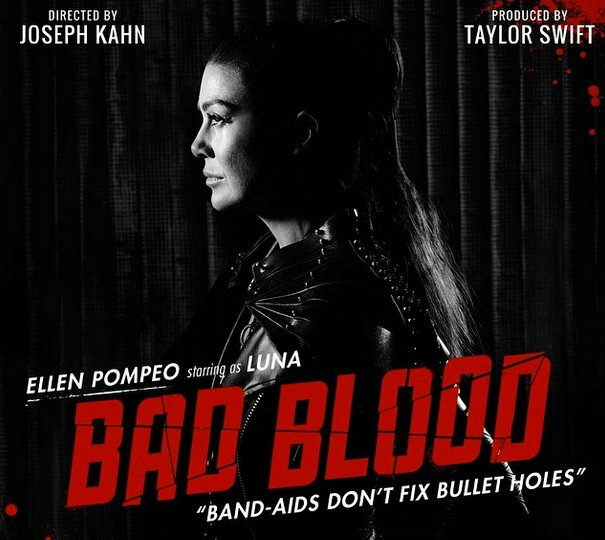 Taylor Swift music video.Ellen Pompeo as Luna. Taylor Swift music video.Mariska Hargitay as Justice. 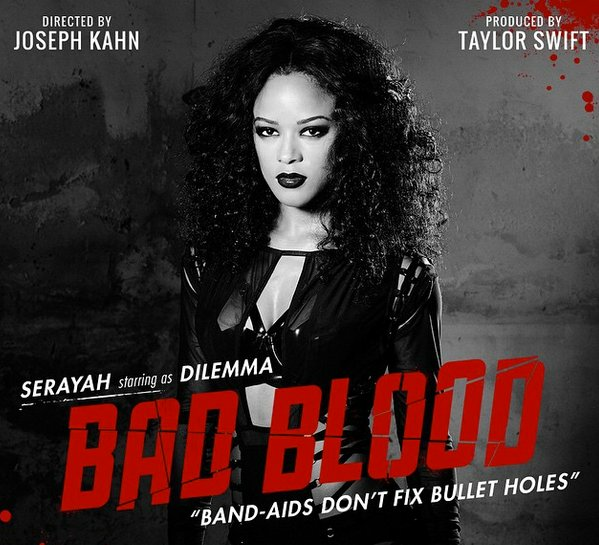 Taylor Swift music video.Serayah as Dilemma. 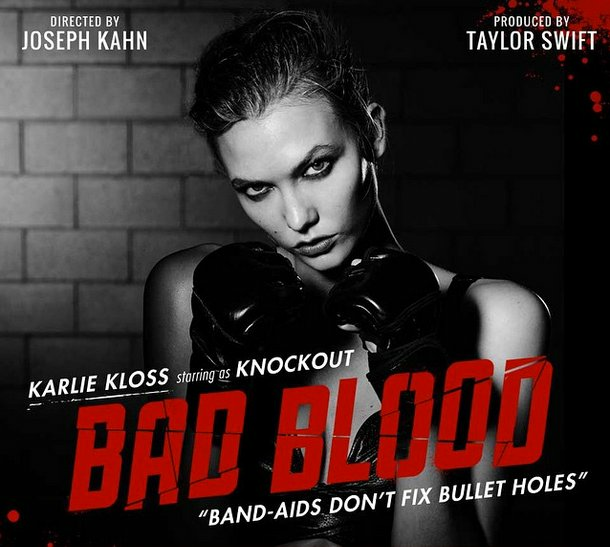 Taylor Swift music video.Karlie Kloss as Knockout. 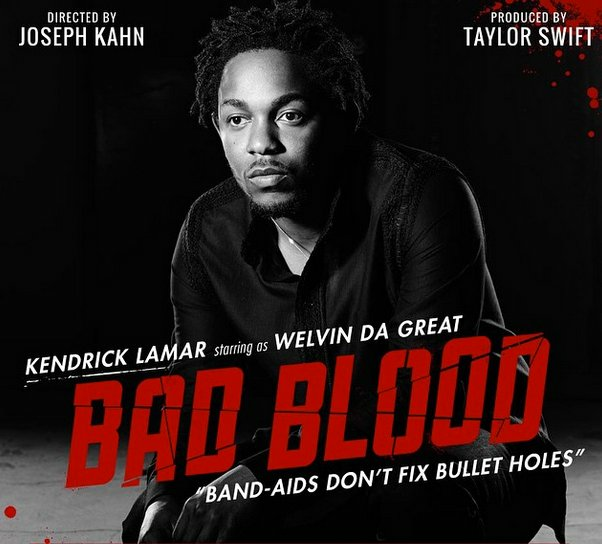 Taylor Swift music video.Kendrick Lamar as Welvin Da Great. 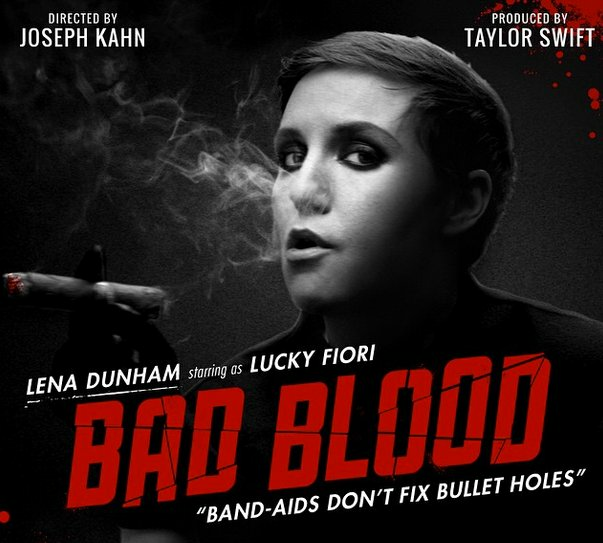 Taylor Swift music video.Lena Dunham as Lucky Fiori. 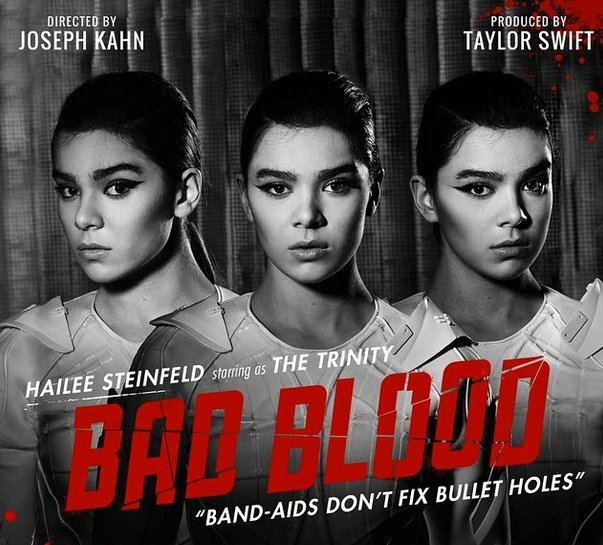 Taylor Swift music video.Hailee Steinfeld as &apos;The Trinity&apos;. 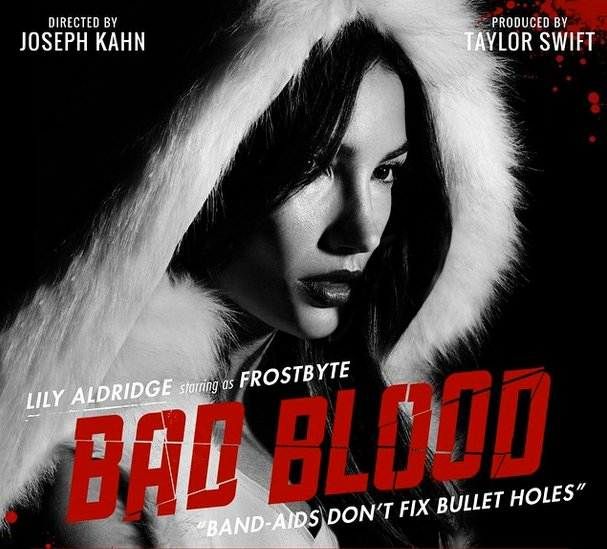 Taylor Swift music video.Lily Aldridge as Frostbyte. 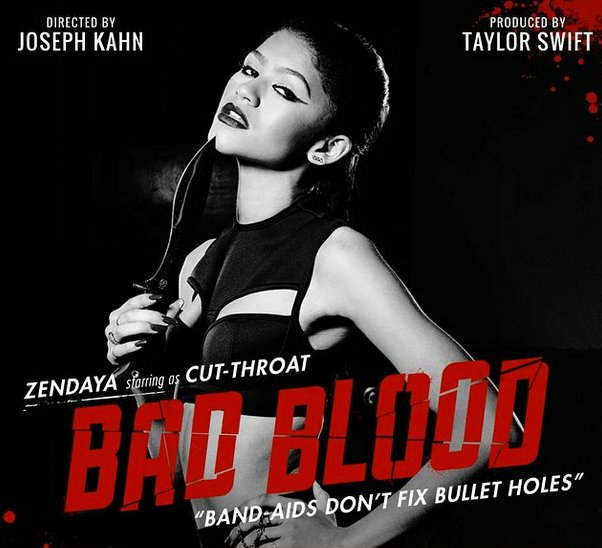 Taylor Swift music video.Zendaya as Cut-Throat. 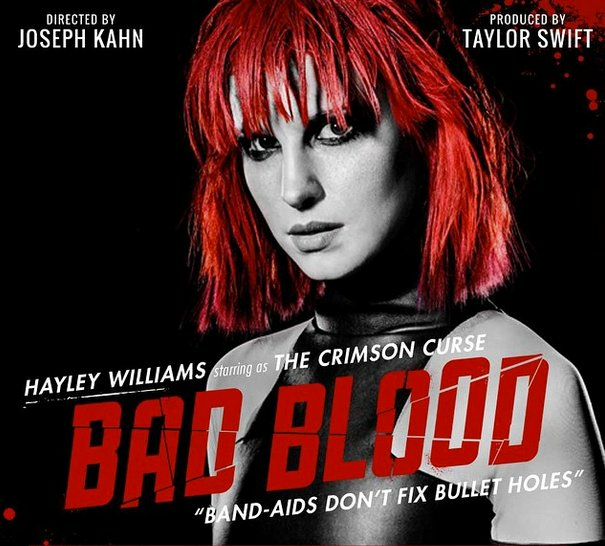 Taylor Swift music video.Hayley Williams as &apos;The Crimson Curse&apos;. Taylor Swift music video.Gigi Hadid as Slay-Z. 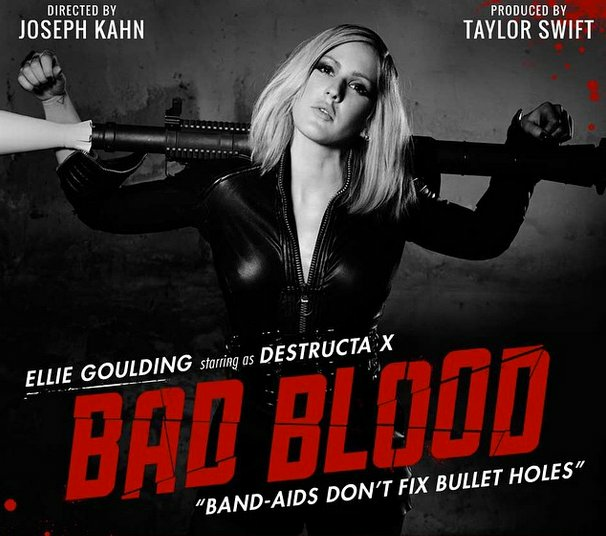 Taylor Swift music video.Ellie Goulding as &apos;Destructa X&apos;. 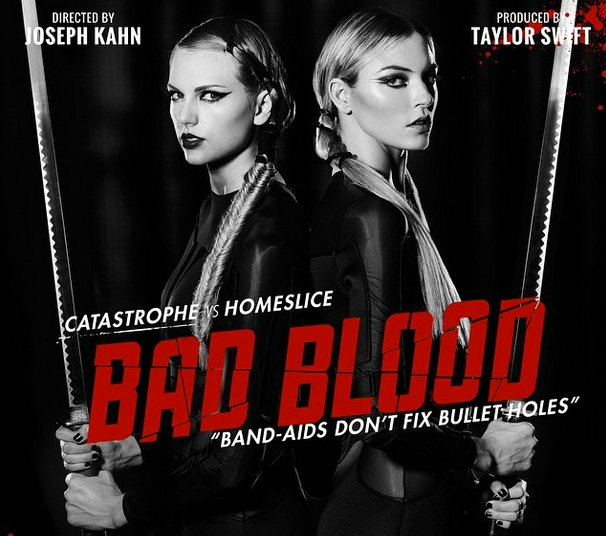 Taylor Swift music video.Taylor Swift and Martha Hunt. Of course, everyone in the audience does want to spend time with Swift and is happy to scream their nomination to be in the Girl Squad. Nobody seems to notice that she doesn’t mention a rule number 3: that you will have to be liked in return. And while there is absolutely nothing WRONG with having beautiful, famous friends, there’s something increasingly uncomfortable about watching Taylor Swift parading them around in every public aspect of her life. There’s something uncomfortable about the way that she appears to be hand-picking the people who can be in her club (Swift recently told veteran actors Sir Patrick Stewart and Sir Ian McKellan: “You two are ULTIMATE Squad Goals”). 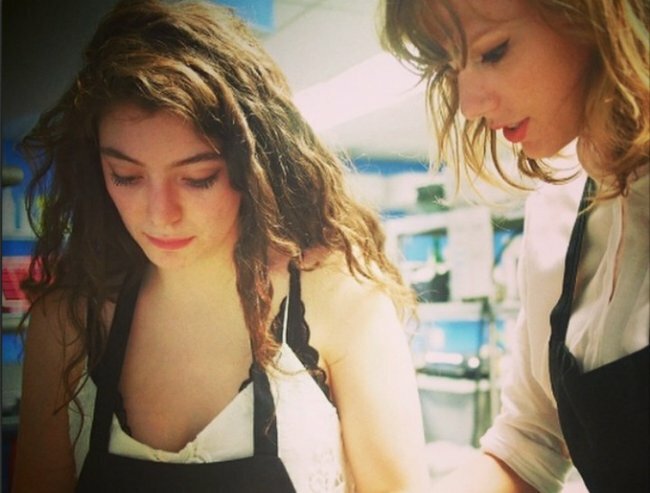 Taylor’s friendship is cool and powerful. Lena Dunham says so. Again, that discomfort creeps in. 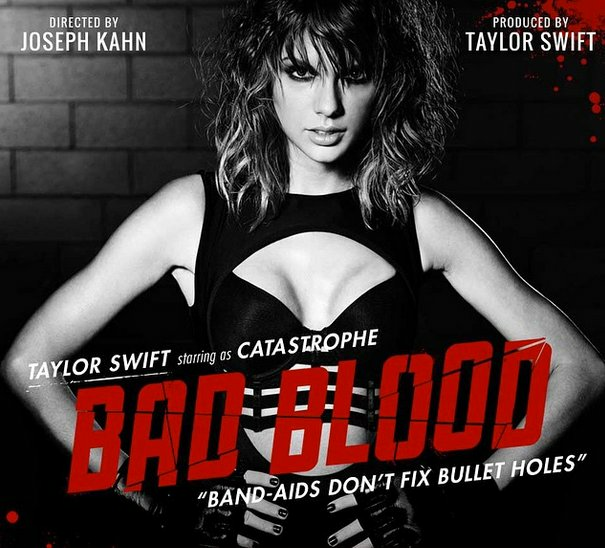 Sure, watching Taylor Swift’s Girl Squad dominate does not upset anyone or make them angry, but it is disquieting. Or perhaps not. Maybe this whole thing isn’t uncomfortable for everyone. Maybe it’s only uncomfortable for some people. Maybe it’s only uncomfortable for the people who find this behaviour all too familiar. Anyone who has ever been bullied by a group of girls or women has seen this behaviour before. There is a group and you’re either in it, or you’re out of it. More often than not, there’s a girl at the centre who decides who is in and who is out. She decides what is fun and what is boring; what is acceptable and what is not. Invariably, she looks a particular way. She tends to have it going on the conventional sense. The girls or women around her love her style and strive to copy it. And for some reason you can’t really fathom, you want to be in this group, because you know it must feel good. It must feel good to be special. It must feel warm to be on the inside. Not everyone will feel this way when they look at Taylor Swift’s girl squad. But some people will. There is a secret language of people who have been bullied. Behaviours that are familiar. Signs and signals that only you pick up. Subtle hints that trigger something inside you that you thought had been put away years ago. 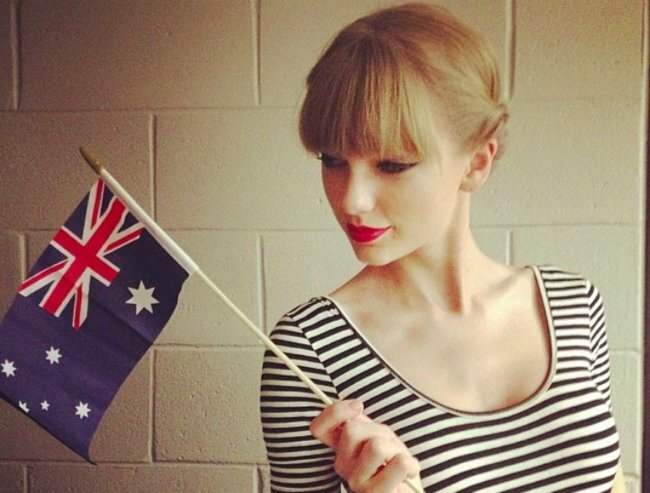 This isn’t Taylor’s fault that she is beautiful and popular. But she does nothing to democratise her “squad”. 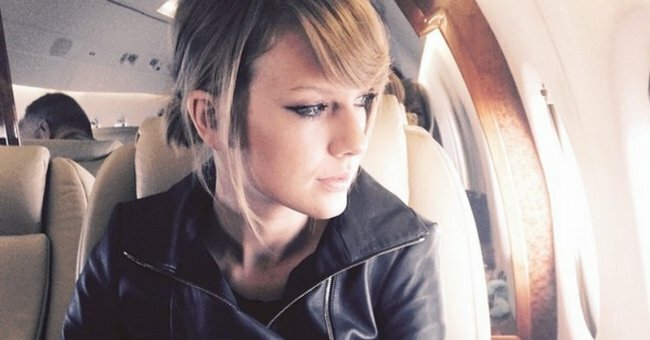 But what she could more accurately have said is: “If you’re feeling down about yourself, don’t look at my Instagram.” Yes, Instagram is a curated space where we show the best of our lives, but if Swift knows how influential her social media profile is, then it would take very little to show both sides of her life. The good and the bad. The loved-up and the lonely. 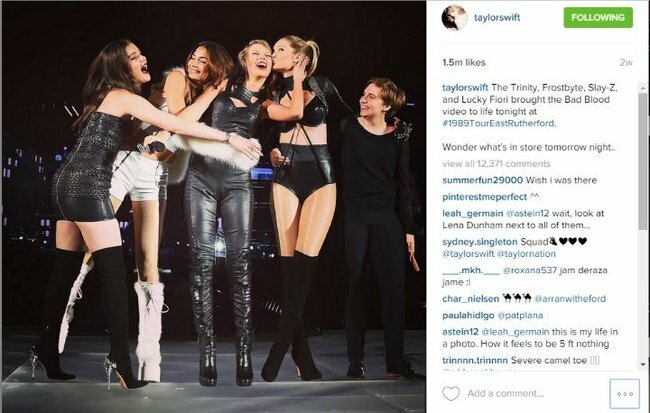 There is something about Taylor Swift’s girl squad that seems to feed this feeling of inferiority. It feels exclusive, not inclusive. Her comments about Nicki Minaj last week underline that sense that ‘you’re either with us, or you’re against us’; ‘you’re either in or you’re out’. Minaj responded saying that she wasn’t targeting Swift. 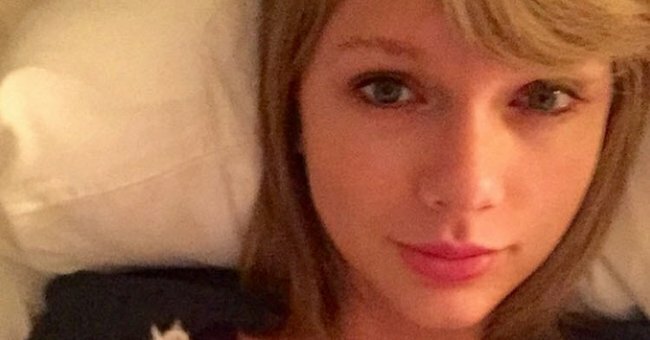 After 24 hours, Swift retracted and apologised. Minaj’s comment wasn’t a criticism, but even if it was, she had been censured. Again, our bulling baggage overlays our reading of this. Swift had been nice to Minaj, so Minaj could not criticise her. It was a statement about control. Minaj was out of control and Swift had to pull her back in. For some reason, Minaj had to walk on eggshells, so as not to anger Swift. Remember rule of friendship #1? “You have to like me.” But that is ridiculous. There is nothing feminist about insisting that women should not criticise other women. That’s as sexist as saying women are not allowed to spit or swear. This isn’t about feminism or solidarity. It is about control. 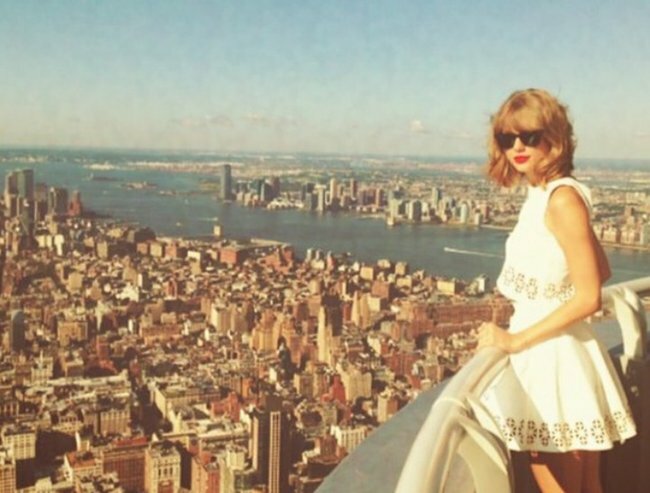 There are many women who may look at this Taylor Swift scenario and feel nothing. But there are some women who will look at it and say: “I know this scenario. I know it and I hate it.” A tightness in the jaw, a nudge in your stomach. You know this. You have seen it before. The people who know this are our squad. That’s the secret language that we share. 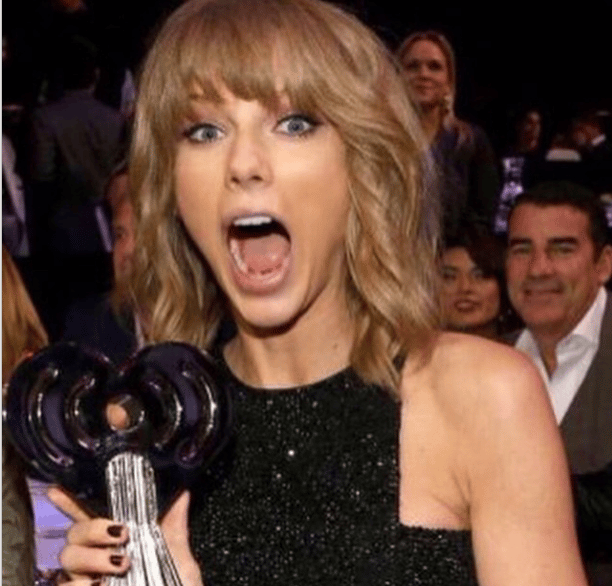 Taylor Swift became pop&apos;s biggest star.Taylor Swift is now the biggest thing in pop. At the Billboard Music Awards. 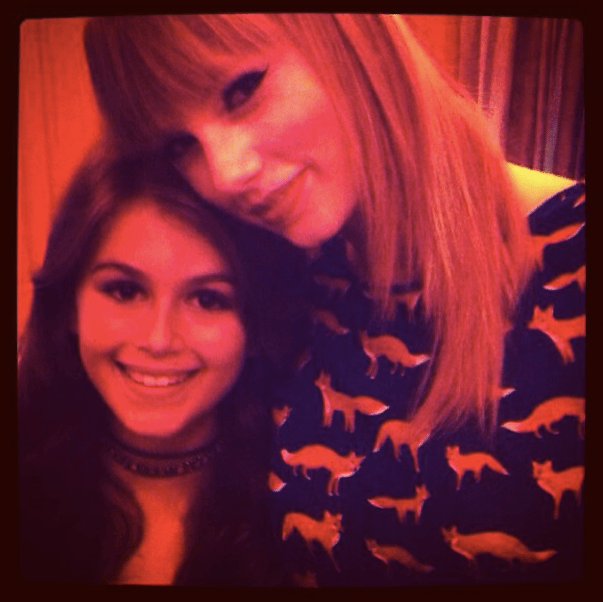 Kaia Gerber With Taylor Swift. Image via Instagram. Women who stood up to sexism. 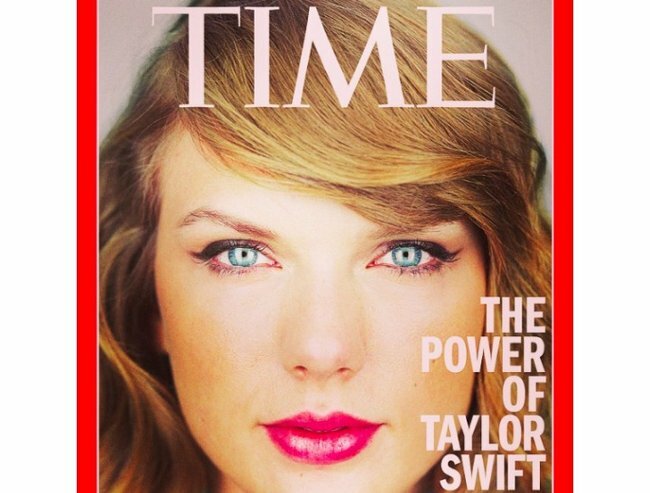 Taylor Swift on the cover of TIME. Taylor on the cover of New York Mag. 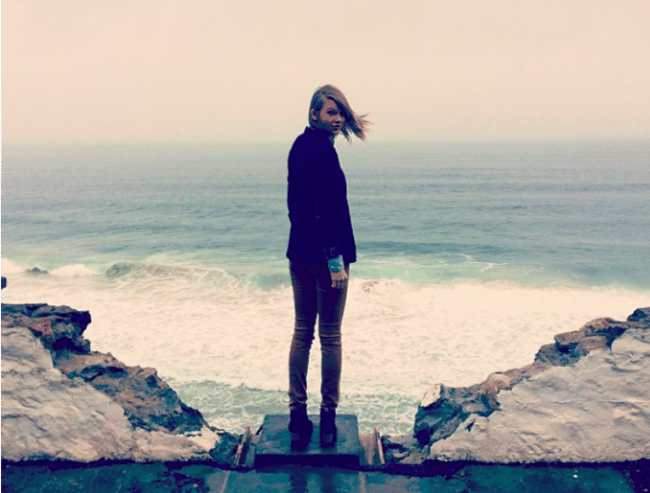 Taylor Swift. Image via Instagram. Taylor Swift at the Grammy Awards. Taylor Swift at the Grammys in 2010. Taylor Swift at the 2010 AMAs. Taylor Swift during the 44th annual Academy Of Country Music Awards&apos; Artist of the Decade in 2009. Taylor Swift at the 2008 Grammys. Taylor Swift at the 2009 CMAs. Taylor Swift at the 2009 ACM awards. Taylor Swift at the 2012 Grammys. Taylor Swift at the CMT music awards in 2008. Taylor Swift at the Country Music Hall of Fame Museum in 2010. Taylor Swift at the 2006 CMAs. Taylor Swift at the 2010 TIME 100 Gala. 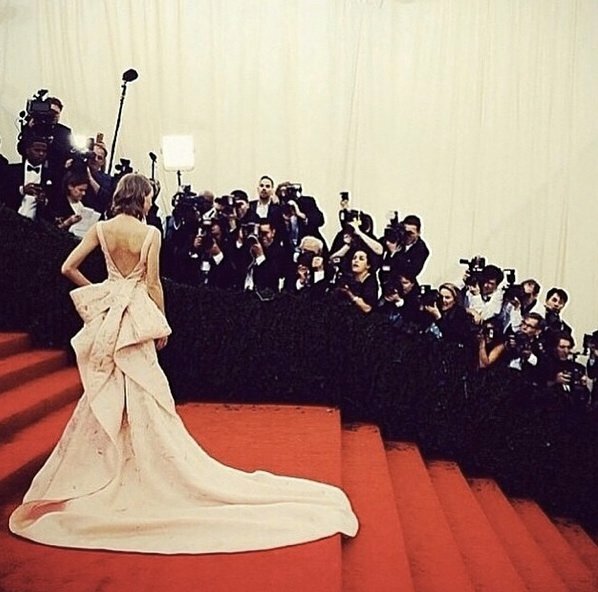 Taylor Swift in Oscar de la Renta at the MET Gala.